Habitat for Humanity of the Magic Valley, Inc. has the great honor of again organizing the September 14, 2019 Rim2Rim Race, a Magic Valley tradition. This event is our primary fundraiser of the year. We are seeking sponsors to help cover the costs of organizing this long standing event and to fundraise, to build simple, decent, affordable housing in the Magic Valley. 5 RACE ENTRIES FREE plus reduced race entry cost for your company racers! Show your leadership and create a Team, design some company shirts …. Make this an annual event to play together! 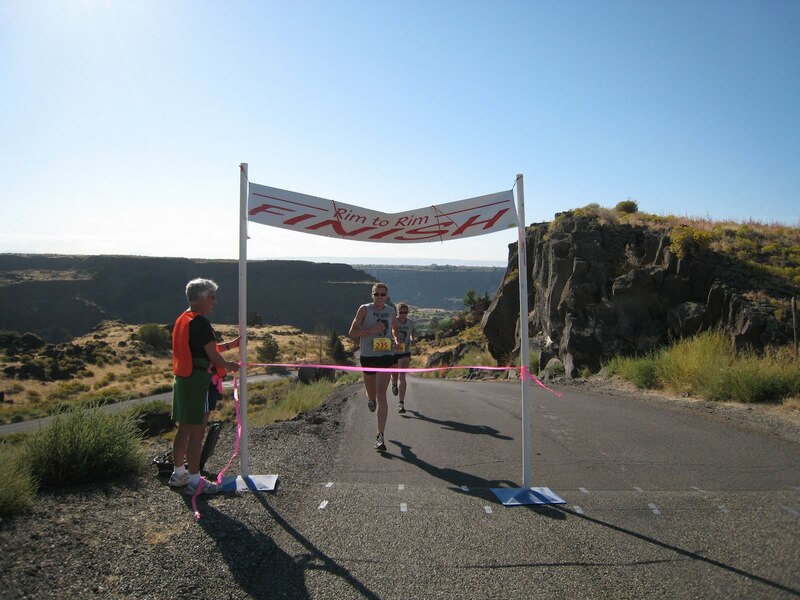 A banner with your company logo placed at the Race Finish Line. Your company logo/name will be prominently printed on the sleeve of the race shirts that are distributed to all competitors and are cherished and worn by the racers for years to come. These shirts are a treasure to the runners and a continued display of your donation for years to come. Your company’s sponsorship will be featured in a large Times News advertisement for the race – All of Magic Valley will see this! Most importantly, you have the chance to help build simple, decent, affordable housing together with families who are in great need, and remember your sponsorship is a charitable tax donation. Reduced race entry cost for your company racers! Create a team and make this an annual event. Recognition for helping to provide funding for the organization of this first class Rim2Rim Race event for runners and walkers from far and near. Your company logo/name will be printed prominently on the beautiful participant race shirts that are distributed to all competitors. These shirts are a treasure to the runners and a continued display of your donation for years to come. Most importantly, you have the chance to help build simple, decent, affordable housing to families who are in great need, and remember your sponsorship is a charitable tax donation. Your company name will be prominently printed on the beautiful long-sleeved race shirts that are distributed to all competitors. These shirts are a treasured and worn by the runners for years to come. Your company name will be printed on the beautiful shirts that are distributed to all competitors. These shirts are a treasure to the runners and a continued display of your donation for years to come. Face to face contact with all 500+ racers and be in the midst of the race. A fun day of team building with your crew. We encourage you to theme the station. Habitat will provide the table, ice, water, cups and trash containers for you. Your part is to add the FUN! The racers will judge the best of the stations and declare the “Racers Choice” winner, Their favorite water station will win bragging rights till next year. The chance to have your company name added to the large travelling trophy and display it in your business for the year as the “Racers Choice Award” for the best water station of the year. Lunch for your crew at the finish line will be provided (a $10 value per crew member). Your Rim2Rim Sponsorship is a tax-deductible donation. A receipt will be returned to you upon receipt of your sponsorship donation with our 501(c)(3) I.D.